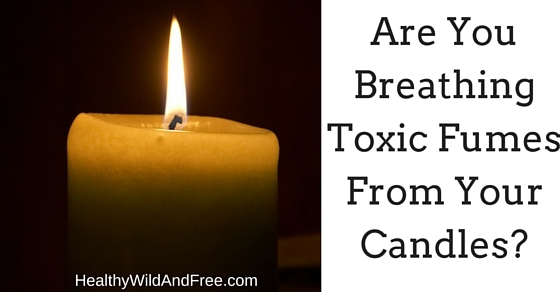 Are You Breathing in Toxic Fumes From Your Candles? Part of my mission is to help educate the people (hopefully you) who are a part of this website and community to live healthier and greener lives. A lot of times we don’t see the correlation of how the products we use on a daily basis impact our health, beyond diet. Everything from the water you shower in, the clothes you wear, to so many other aspects of health in your home. Recently I was looking for candles to buy, because I love having that homey atmosphere and candles really do add a lot of comfort to a home, for me at least! and I knew I wanted a natural candle that was free of the chemicals and regular petroleum based compounds in traditional candles. So I started researching and found out about some of the most commonly used chemicals in candles that are both toxic and in some cases carcinogenic as well. When you burn candles you are burning whatever is in the wax into the air that you breathe. If you are burning candles that are full of petroleum by-products, chemicals and waste products then you are breathing this in and causing more of a state of internal toxicity in the body. Not only that but a candle that is made of green materials, such as beeswax, allows for a sustainable method to continue to create candles while not harming the environment. Bee’s create wax and it would be better to use that than cultivate chemicals that cause more environmental and health problems. A few commonly used chemicals used in candles are paraffin, paraffin is a petroleum by-product and known carcinogen. This is also used in many different cosmetic products. You don’t want to use products that contain this, whether you are using it on your skin or breathing it in from the candle scent being burned. Certain scented candles typically don’t use natural scents such as essential oils or natural based scent compounds. They typically use chemical based petroleum by-products. The whole plastic industry is a by-product ‘industry’ from the petroleum industry. Some scented candles also have lead in the wick so you are burning this compound into your home and breathing it in, which is not healthy. In fact, the university of Michigan released a study showing that 30% of candles in the USA release lead into the air. So there’s almost a 1 out of 3 chance that the wick alone is releasing a dangerous and unhealthy heavy metal into your home, let alone everything the wax burns consistently as well. Benzene and Toluene are two other toxic chemicals that are commonly found in candles and are known to have cancer causing effects on the nervous system. Beyond that, there are many other chemicals, scents, gels and compounds that do not burn a healthy fume that supports your health, since you breath in these fumes. So what can you do? You and your family can do your research and find an all natural candle. There are soy candles out there but I prefer to avoid them because most Soy is genetically modified and I don’t want to support the GM industry even if it’s not in the form of food because it still pollutes our environment, and harms our health in many ways. Recently though, I discovered by searching for candles on amazon that you can get beeswax candles. 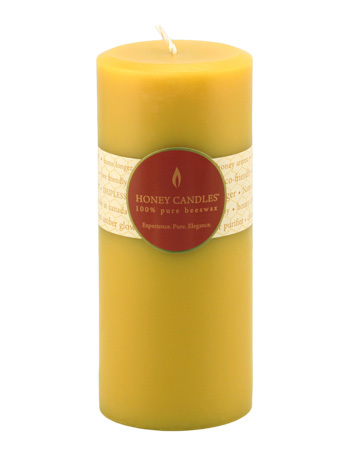 I then searched google to delve into this deeper and I found a company called Honey Candles at PureBeeswaxCandles.com that carries 100% pure beeswax/honey based candles. They have pillars, blocks, ornamental candles, seasonal candles and so much more. All natural and free of the chemicals, carcinogens and unnatural scents. Recently I just got some and have only used them once but love them so far! they don’t have too strong of a smell like most traditional candles do. As you can see in the picture here you can see that I have several different candles as well as even a candle shaped like a christmas tree! It’s a Canadian company but they ship to both Canada and America. The great thing about 100% pure beeswax candles too is that these candles produce negative ions when they are burned as well, which can improve and purify indoor air quality as well. They have a sweet honey aroma, are eco-friendly and are handmade, and of a much higher quality than other candles i’ve had before. I highly recommend to understand your candles, to understand the composition of the candles that you burn and to know whether or not your candles contain chemicals and carcinogenic compounds. Even if Honey Candles cannot ship to your country, understand this information and search for higher quality handmade candles free of all these added carcinogenic compounds. To a healthier you, a greener home and a greener planet! P.S. You can see the picture of my candles that I got from Honey Candles on my facebook page here. P.P.S. You can see a video of me explaining here how the candles have more value than typical candles below. Also, Candles and himalayan salt lamps (click here to learn more about those) are the healthiest forms of lighting before sleep, so keep that in mind! Honey Candles is a wonderful company located in a remote mountain community in British Columbia Canada. We take pride in being a very green business and we've provided their beautifull candles to guests in our cottages as well as selling them in our gift shop for the past 9 years. Our guests love them as much as we do and we know you will too! Awesome! yeah, they really do seem like great people over there. Their candles are great! "The great thing about 100% pure beeswax candles too is that these candles produce negative ions when they are burned as well, which can improve and purify indoor air quality as well." – Show me the proof, that is a load of nonsense. All candles produce toxins when you burn them, even "pure" beeswax ones. They all produce soot that get into your lungs and can cause cancer. No candles are safe. Essential oils and a diffuser is better than all of the "clean" candles combined. No burning or warming. Simply essential oils and water go into the air!